There is one certain common thing you mostly will experience when you are traveling in Bali. It is that you will take more images than before. How can you don’t do that while you are in the destination where many travellers are heading to? That’s why, you will really need the photography tips to make your pictures more valuable. Knowing that you are probably taking more pictures than ever, you will really need more space memory for your camera or phone. If not, try to make use of the cloud storage where you can upload all the images to internet. If you are also planning for special occasion while traveling with your friends or in a couple, make sure that your Bali photography needs will be fulfilled by the professional photographer or a photo studio if you think you will need to rent one. If you are truly the photo fanatics, no matter how professional you are, you may still need some references to take your better images to be brought home. It is because this may be your first time visit so you don’t know many things about the area. Just so you know that I won’t mention about where the hack are the instagrammable spots for your Bali photography adventure or the best spots that are popular until today. You can find them all about that in a minute just by typing your needs on Google. But I will remind you something that people are forgetting that they don’t just really need the best place for their aesthetically pleasing images, they do really need to know when to take them. 1. Come earlier to the destination for your photography spot when people may still in sleep. Do you think I am joking about this? Look! The popular the destination especially that is really supporting the unique and aesthetic images, the harder for you to get the better shots. You may will hear some people are yelling at you just because they are also in line to take the same spot for taking images. So that, you’d better plan to go to the spot earlier than most people will do. Sunrises will also great to get the better nature lighting and you will taking images in peace. 2. Be aware of what you can see and get you at the destination. 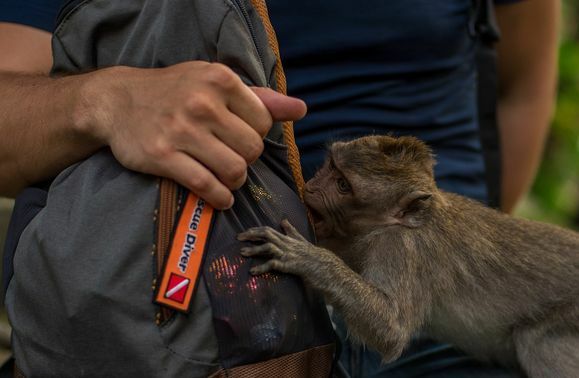 There is a pretty much popular destination in Bali called as the Monkey Forest. There are so many monkey at there and no wonder the place named as it is. And you know what, since it’s not the zoo, then the monkeys are free to move here and there. You can say, it is the wild and surely it is the forest itself. The thing is that, monkeys can be the challenge for your photography experience as the image above. They may can take your camera away, so you’d better put the strap of your camera if you are bringing it. So does when you are going to the forest, never ever wear the thin gown or shirt to be more safer at the forest. Anyway, I have seen some that getting to the forest wearing just like the short gown though I don’t know why. 3. Brings waterproof camera or such gears to take images underwater. In case you have got a waterproof camera and lenses and the other gears that are supporting you to take images underwater, don’t forget to get them all since you may will really need them. You can also consider to rent them if you want. I am telling you this since there are some interesting activities on the sea or at the beach such as riding on banana boat, snorkeling or even diving. So, if you want to keep on taking images by yourself, then why not. Those are some of the unusual but important Bali photography tips to help you take images as travellers in comfort while traveling around at the destinations. Hope you can get advantages of them.